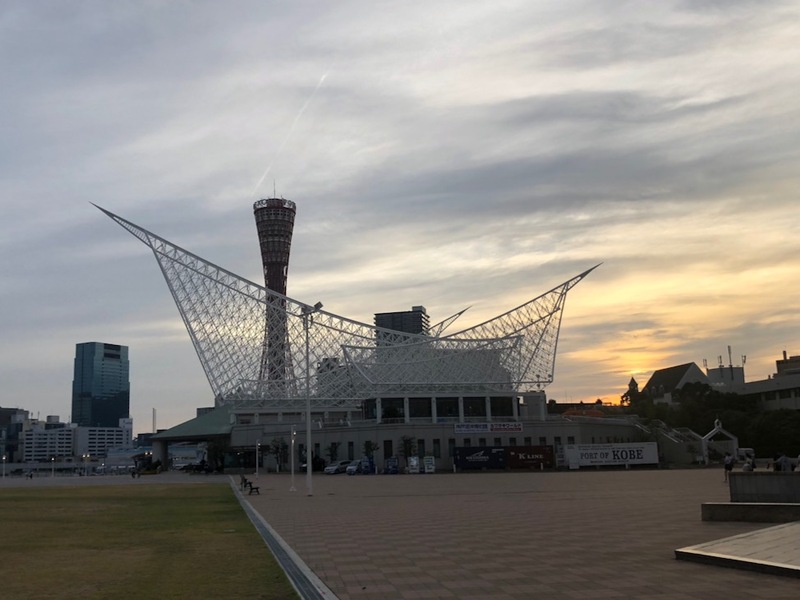 In this post: Kobe waterfront and the Meriken Park; what does Meriken mean? 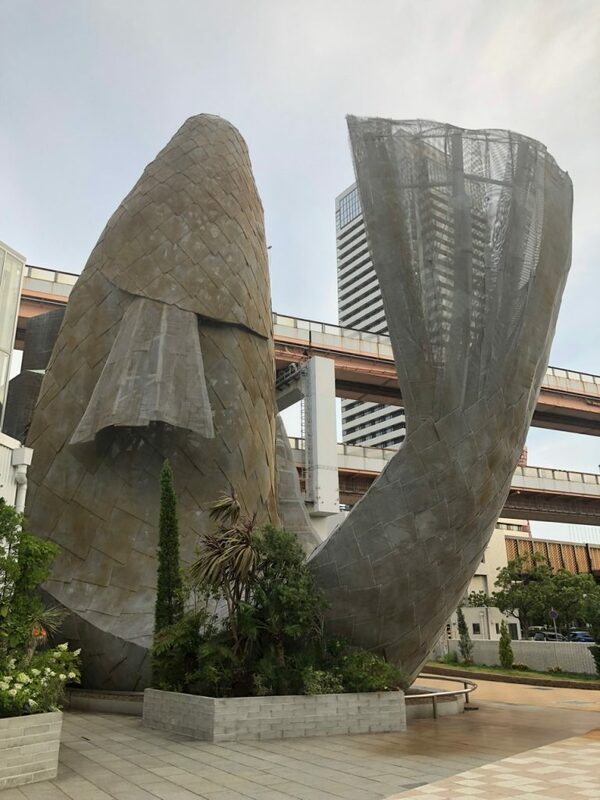 ; the bright side of the typhoon; the Great Hanshin Awaji Earthquake Memorial; BE KOBE project; Frank Gehry’s Fishdance; Yoheyy mural. Japanese summers are not for the faint-hearted. Oppressive combination of heat and humidity elevates an easy climb into a personal Everest and propels electrical bike from a silly idea to a brilliant invention. Hiding inside an air-conditioned bubble feels good for a day or two, but then morphs into a luxury trap. The heck with the 21st-century conveniences, let’s wonder the land of the rising sun. For three sweltering summer months, we lived in a village on the outskirts of Nara. We quickly found out that bicycling could be problematic. Armed with a list of things to do in Nara, we ventured to see famous deers. Ironically, bicycles are so popular in Japan that parking them within a reasonable distance from historic sites became a headache. Lesson learned, two legs would fare better than two wheels. Following this philosophy, we sweated through a succession of trains finding ourselves in Kobe. We had a plan and a neat map outlining our visit. It took about 15 minutes, a walk from the station to the waterfront, to forget about all our intentions. Kobe is a modern city in Hyogo Prefecture, 33km west of Osaka. Along with Yokohama, Kobe is one of Japan’s first international ports and trading centers dating back to the city’s opening to foreign traders following the 1853 end of the policy of seclusion. First of all, I have to say unimaginable – Thank you, the 12th typhoon of 2018 for making our Kobe excursion so pleasant. After unbearable heatwave that baked the entire country for more than two weeks, the winds that preceded typhoon’s arrival cooled off the air to “comfortable” thirties (Celsius scale, of course). Still sticky, but so much more relaxing to walk around. By the way, after years of living through countless hurricanes on the East Coast of the US, news about another typhoon was not overly exciting. Thankfully, this one decided to be considerate and spared Japan from any significant damage. Secondly, to whoever attempts to write another Kobe travel guide – please, try harder. 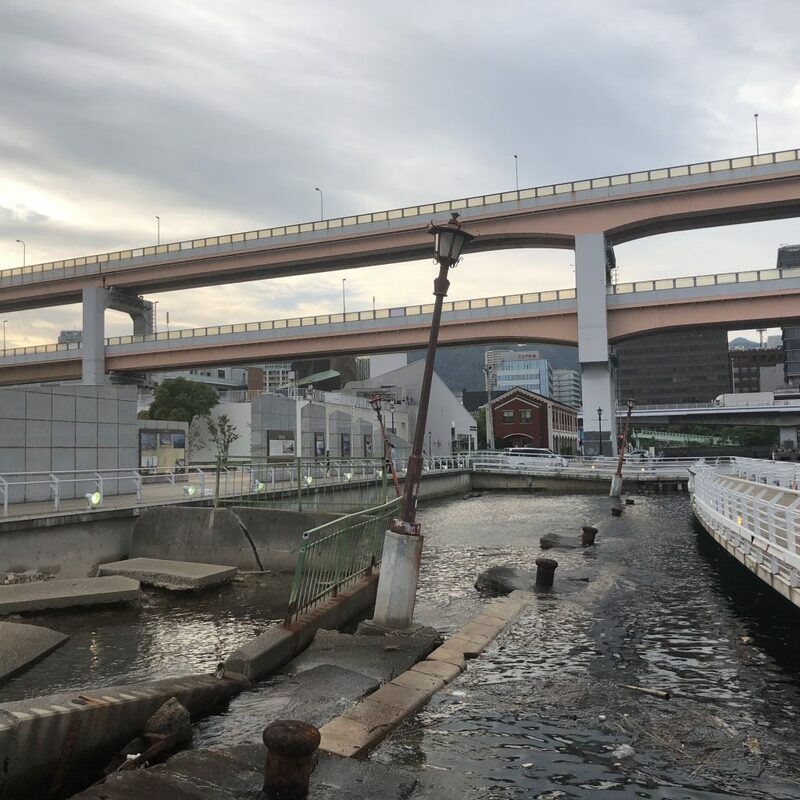 Since there was a remote possibility that we might stay there, I spent hours poring over whatever information was available online – mostly blogs along with a few articles from local tourism boards – trying to figure out what is Kobe. The resulting picture came out rather dull. Naturally, the famous beef uniformly popped up everywhere. As it should, so no complaints here. Wagyu (和牛 Wagyū, “Japanese cow”) is any of several breeds of Japanese beef cattle. Therefore, Kobe Beef is always Wagyu, but Wagyu is not always Kobe Beef. Kobe Beef is, perhaps, the best-known type of Wagyu outside Japan. However, there are others (e.g., Matsuzaka and Yonezawa Beef) that are equally or even more famous among Japanese gourmands. Kobe Beef is meat from a very particular strain of Japanese Black cattle called Tajima-Gyu raised to strict standards in Hyogo prefecture. Kobe is the capital of Hyogo, thus the name. Only 0.06% of the beef consumed in Japan has the Kobe distinction, with just about 3,000 cows certified as Kobe grade. Despite popular belief, the cows don’t drink beer and get massages. Back to the city attractions, choices seemed to be relatively limited. Chinatown, visiting an onsen, sake tasting, shopping, riding a ropeway, walking through Kitano-cho (an area where European merchants lived), shopping again… Hmm, comparing to Tokyo or Kyoto, it’s easy to understand why Kobe is not among the top places to visit in Japan. If you dig deeper though, there are some surprises. Curiosity is the key. If you came to see the city, get up and walk around. The Akashi Kaikyo Bridge, the longest suspension bridge in the world, is just a short train ride from the city. We went there during the day. By chance, I noticed a flyer advertising nighttime illumination of Kobe. That’s how we ended up on Kobe’s waterfront about a week later. Luckily, we came a few hours before sunset. 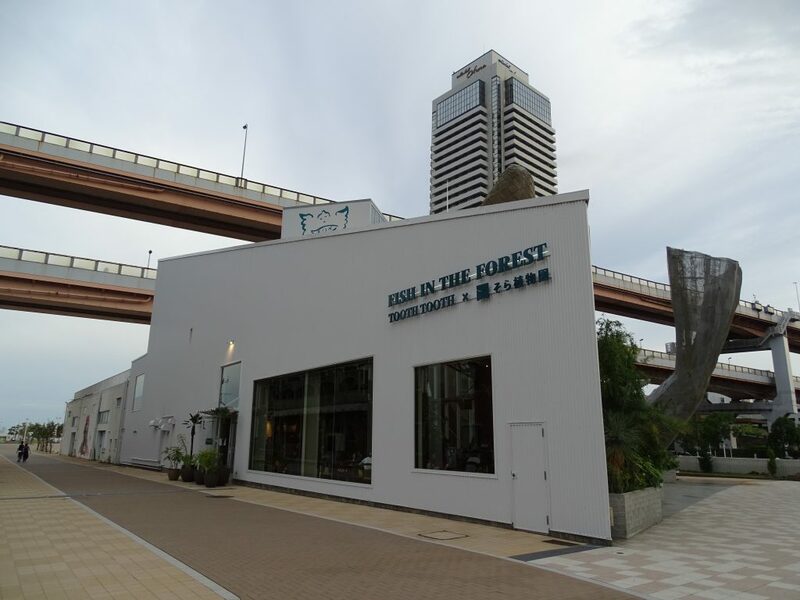 It was enough time to find out what all those Top Things To Do In Kobe I read before missed. Maybe they did it on purpose to keep rowdy tourists out? Fish in the Forest Botanical Beer Garden. There are two remarkable things next to this building. Can you spot them? A pint of beer after walking on a hot summer day is a lifesaver. A beer garden conveniently settled in one of the renovated buildings left on the fringes of Meriken Park. People of Japan never cease to amaze me with their ability to come up with creative titles. Just read the full name of this establishment: Fish in the Forest Botanical Beer Garden. Perhaps, a generous amount of greenery inside the place could explain the botanical reference, but why fish? That’s when we saw a… fish’s tail?… poking on the right side. Have you noticed it too? The iconic Fishdance Restaurant designed by Frank Gehry. Bingo! This is not an ordinary fish though. We stumbled upon a work of a man who is called the genius of design. Frank Gehry is a Canadian-American architect famous for postmodernist buildings. The Guggenheim Museum in Bilbao, Spain, the Dancing House in Prague or the Walt Disney Concert Hall in Los Angeles are just a few examples of his work. 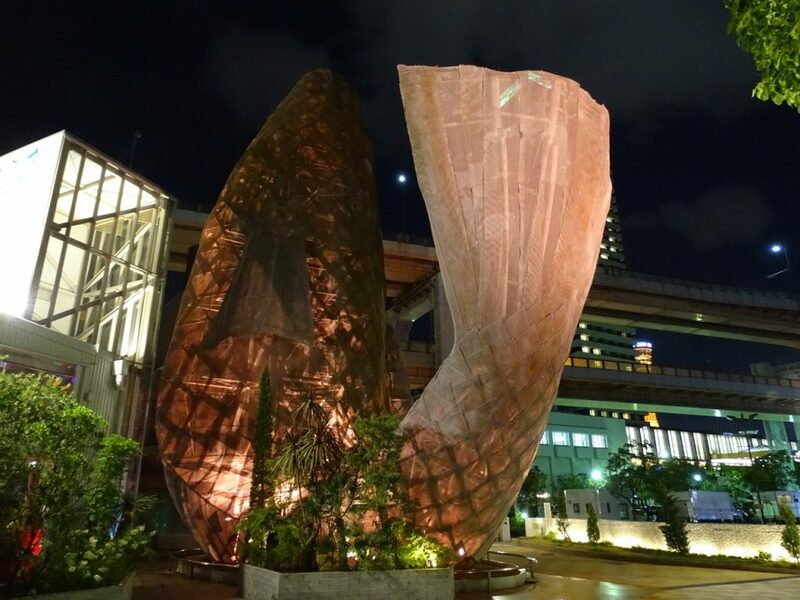 Frank Gehry built a restaurant in Kobe partly in the shape of a fish, his favorite form. The fish with metal-scaled tail shoots up four stories. I got an impression that this extraordinary creature got cornered by an ordinary looking buildings. The design and construction took place in 1986-1988. The sketch of this design is on display in MoMA in New York. This fish is definitely a night creature. Even if you checked it during the day, you have to come back at night to see it in all its shining glory. Done with the fishy stuff, let’s look to the left from the beer garden. There is a whimsical painting there on the wall. Our rural Japanese living arrangement wasn’t street art friendly. After two months in the country, this is the first mural we found. Here comes another name for my ever-growing collection of street artists. Yoheyy, sorry, I couldn’t find his real name yet, was born in Osaka. He is a professionally trained artist with a unique, colorful style. 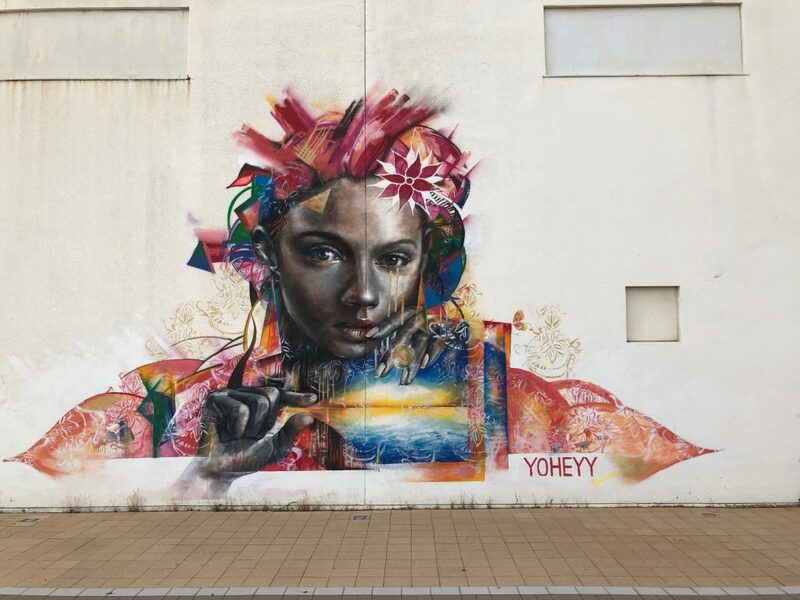 The mural combines a photorealistic portrait of a woman with a vibrant futuristic background. The elements interact creating both contrast and unity between the woman and the scene. This seems to be a recurring theme through half of his paintings – a masterful combination of imaginative, surreal elements with conservative portrait rendering. Reality and dreams collide and interwind at the same time. See more his works here. We are walking through the Meriken Park now. It was opened in 1987 and quickly became one of the favorite spots among locals. 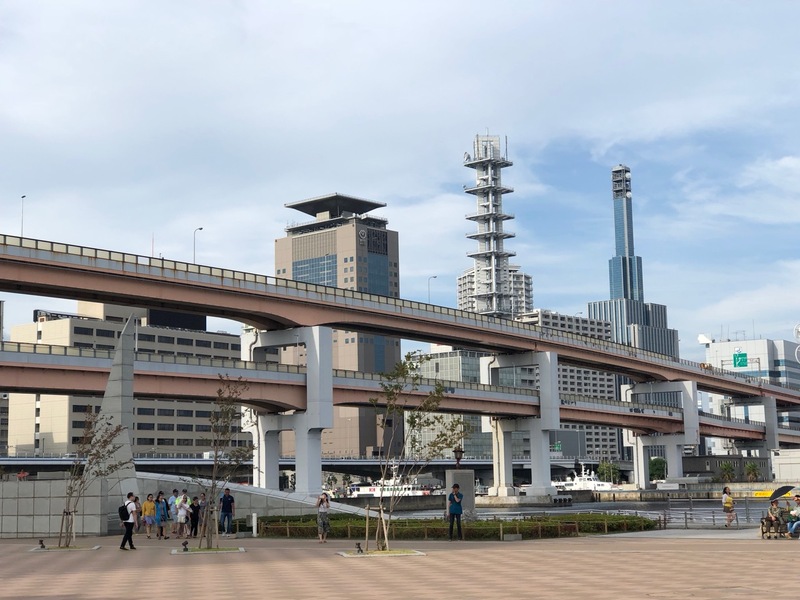 The park was established on a stretch of reclaimed land between two piers, Naka-tottei (the Central Pier) and Bankoku (the International Pier). However, Bankoku was better known as the Meriken Pier due to its proximity to the American Consulate. “American” was pronounced “meriken” by the local folks. Thus, the familiar name was given to the park too. The park is meticulously maintained. Yet, some lamp posts along the water are standing at such precarious angles. In 1995, Kobe was devastated by the Great Hanshin Earthquake. Although the city, including the Meriken Park, was completely rebuilt, a stretch of damaged waterfront has been left unrestored as a reminder of the earthquake’s tremendous destructive power. It became a memorial commemorating the many victims who were killed on that fateful day. This used to be a part of a pier. Now, this is the reminder that in 20 seconds 6,434 people lost their lives. 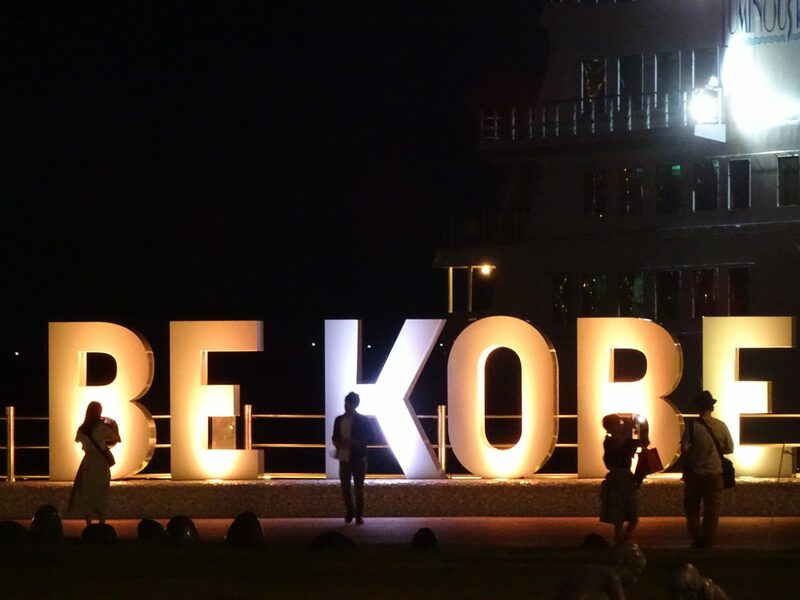 The big bold letters right next to the water form two words: BE KOBE. There is an inspiring story behind this monument. Be Kobe is the project immortalizing the lessons learned from the disaster, the message from those who lived through and told the story of how the city was reborn. Beginning from January 2015, the 20th anniversary of the earthquake, people who are creating the new Kobe shared their thoughts. 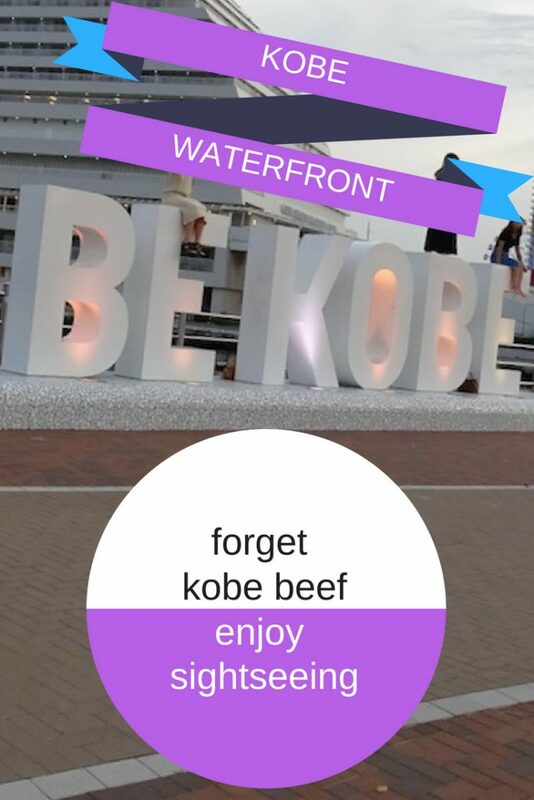 In January 2017, while celebrating the 150th anniversary of the Port of Kobe, the words BE KOBE were prominently displayed on the waterfront to raise awareness of the project. The Meriken Park is dotted with modern art installations. Some are more abstract than others. Sometimes you can guess the meaning; sometimes you need to know Kobe history to understand it fully. In any case, the visual journey through them is rewarding. There is a Japanese saying “If you can’t go to Paris, go to Kobe.” It refers to the city’s cosmopolitan and somewhat exotic (by Japanese standards, of course) reputation. Since the early 2000s, the Kobe Fashion Festival and the Jazz Festival found homes there. The sculpture called the Bell of Hortensia (aka Hydrangea macrophylla) was installed to celebrate the first Fashion festival. Incidentally, the hydrangea is the city flower. Finally, we got to the two most prominent attractions of the waterfront. 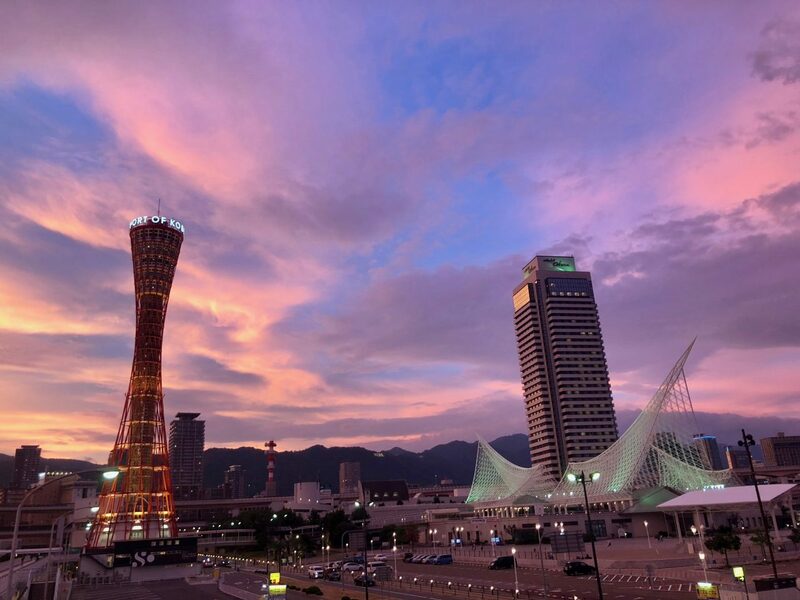 It is home to some of the city’s most iconic contemporary architectural gems – the red Kobe Port Tower and the Kobe Maritime Museum. These buildings are marvels of modern architecture. 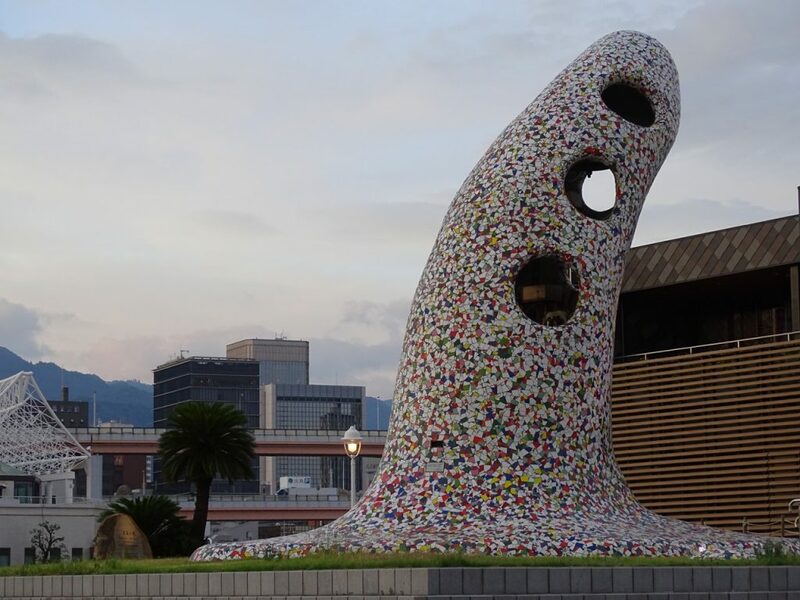 The tower, shaped like a Japanese hand drum, proved to be 100% earthquake resilient. Moreover, both structures are visually stunning at any time. However, we learned first-hand why city officials go to great lengths hinting that you should see Kobe at night. It is the spectacle that shouldn’t be missed. Check how Kobe transforms at night. The illumination of some buildings is beautiful while the velvet blanket of the night makes unlit places mysterious. Japan is one of the fastest countries in rebuilding. As i read your articles, Kobe has been in progress in the history of major aftermath. Really really neat Elena. 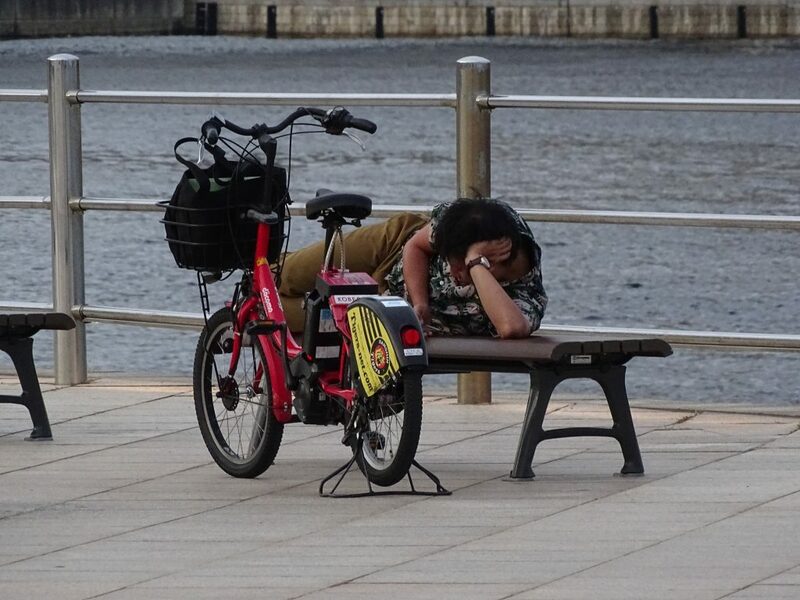 My wife stressed how hot and humid Japan got during her stay there a while back. Super hot and humid in NYC for weeks now; sweating like a pig LOL. I did enjoy Kobe beef at Tao here a LONG time ago but am a veggie guy mostly. Gotta love all the cool things to do in this city. Rocking post! We used to live in Osaka and visited Kobe many times. Hiking up Mount Rokko for views over the whole city was one of our favourite things to do. 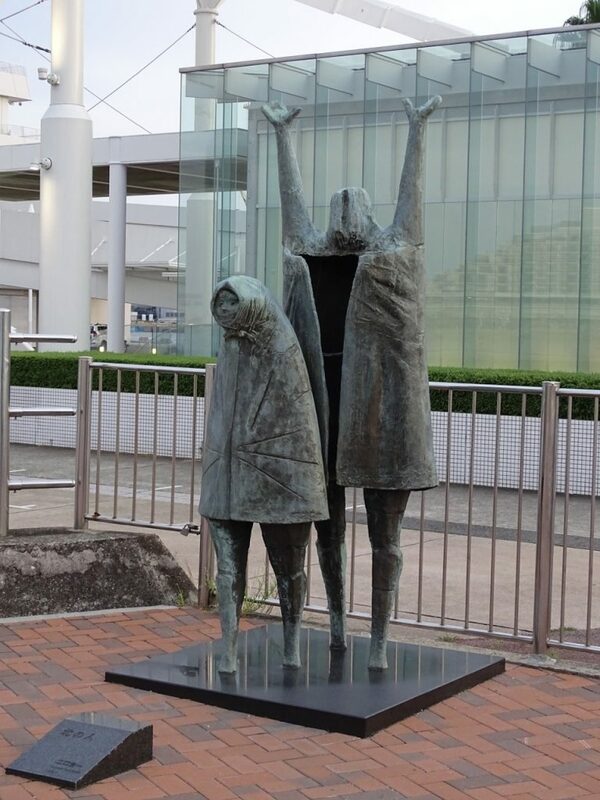 The Japanese on the sculpture says ‘Northern people’. Great to hear from you, Maddy. Thanks a lot for the translation – that helped tremendously. I found some information about this sculpture based on its title. Cheers! Kobe is a second home to me. The Harborland area has been transformed in the last couple of years, making it a must see spot now. But next on my radar is indeed a guide to Kobe! – so stay tuned for more on that. Looking forward to your follow article about the nighttime.